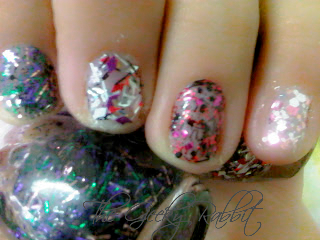 I received a set of Dear My Party Nails nail polish a while back, and decided to try the polishes out. The collection of glittery nail polishes is a fun twist to the summery nail look that I have featured, and it has a very 'party' look indeed! I had 5 different shades of the Dear My Party Nails polishes, so I tried out one shade on each nail. I did not use any base color, so the photos would accurately depict the shade of the glitters. The shades shown in this photo are (from left to right): PGR702, PWH905, PRD301, PPK005. Among these 3 shades, PGR702 and PRD301 (on the index and ring finger respectively) have a sheer black base color. The other polishes are clear with glitter and tinsels. My favorite has got to be PPK007, as seen on my thumb. There is a mix of green, purple, yellow and orange glitter flecks. The bits of glitter very in size- there's the big pieces, as well as tiny glitter sparkles in the polish. A great color for summer and extremely unique! It would definitely go great with a citrus base color. The glitter is true to how it appears in the bottle- what you see is what you get. I applied 3 coats for the glitter to show up more on the nails, and did not finish off with any top coat as I prefer the textured feel. 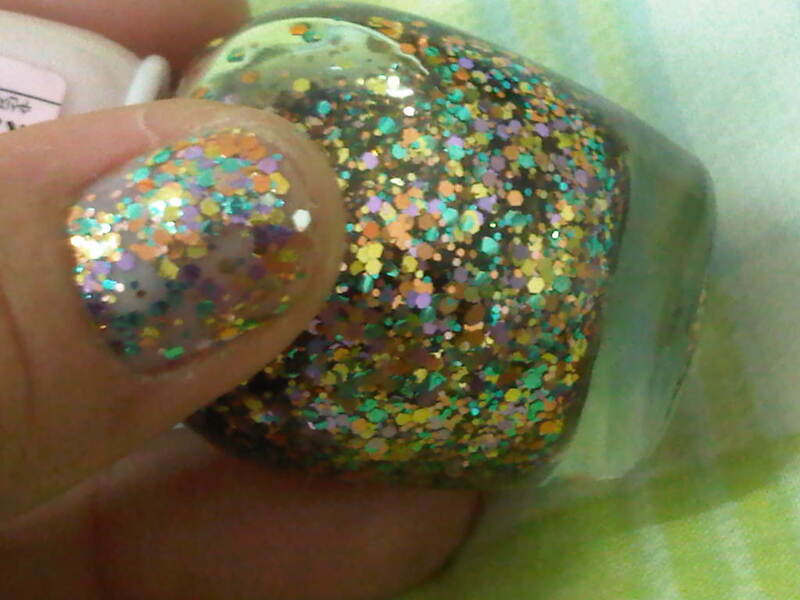 The staying power for the polish is excellent, so the glitter does not chip off without any top coat either!